Richard Simon-Lewis, UKEF's Head of Origination, Client Coverage, Marketing and Communications, reflects on a successful inaugural event for UK businesses. Last Wednesday, UK Export Finance (UKEF) and the Department for International Trade (DIT) hosted our first UK Trade and Export Finance Forum. We designed the event to showcase how we help UK companies to export and inspire more businesses to get involved in major projects overseas. It was a packed day, with government ministers, overseas buyers, in-market experts and senior industry representatives all present, together with over 300 UK companies looking to grow internationally. UKEF is at the centre of the government’s commitment to trade promotion. We’re leading with finance – using our trade and export finance offer to maximise UK content within the supply chains of overseas projects. Our Chief Executive, Louis Taylor, opened proceedings with that message. He went on to highlight our strong track record across the world. From hospitals in Ghana, power supplies in Iraq, manufacturing equipment in India and drilling simulation systems to Argentina – our support has made the difference. Now we want to inspire even more UK businesses to grow overseas by supporting projects like these with finance and insurance. 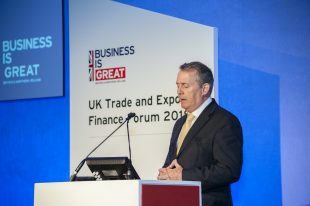 Secretary of State for International Trade, Dr Liam Fox, then announced a groundbreaking partnership between UKEF and Atkins International, the engineering and design consultancy, to identify and promote opportunities for UK suppliers. This will open more than 15 international markets for UK infrastructure and engineering suppliers, proactively bringing business to the UK. The Secretary of State also announced our support for phase four of the Dubai World Trade Centre project. The £100 million project is expected to generate significant business for UK suppliers. Minister of State for Trade and Export Promotion, Baroness Fairhead, set out the government’s plans to put a world-class export finance offer at the heart of UK trade. In the Export Strategy, due to be published later in the year, we can look forward to measures aimed specifically at boosting awareness of UKEF’s offer and a commitment to helping more UK businesses access our services and products. There was plenty going on at the Forum once the speeches were finished. Six government trade envoys shared their thoughts on what makes a successful deal in both developed and developing markets. Our export finance managers and product specialists were on hand for 1-2-1 discussions. There were panel sessions on exporting culture, export finance trends and key areas of growth, and some of our customers discussed how backing from HM Government helped them seize high-value opportunities overseas. Contributions from banks, overseas companies and trade associations were spectacular, and the event definitely captured the vibrancy, confidence and ambition of the UK exporters in attendance. It was fantastic to hear first-hand about the positive impact of UKEF support. This is the first event of this size that we've put on in many years, and we want to establish it as an annual fixture in the years to come. As we continue to increase our engagement with exporters and would-be exporters, events like this give us the opportunity to contribute to UK’s exporting community. The demand for finance and the richness of the conversations on the day make me excited to see where we can be by next year! Watch more reflections on the Forum on YouTube, and see photography from the day on Flickr.